MarsHydro 300W LED Grow Light Review: Buy or Avoid? Home / LED Grow Lights / MarsHydro 300W LED Grow Light Review: Buy or Avoid? Do you have some exotic flowers, simple garden vegetables or even medical marijuana in your indoor grow area? I do! The best part of my indoor grow area is how effectively it allows my plants to grow and mature especially with the amazing MarsHydro 300W LED Grow Light. It’s one of the cheap and best grow lights for vegetables, flowers and aquatic plants. Mars Hydro 300W LED review demonstrates the great features that make this light the best option for growing your indoor Plants. 3.0.1 What is the impact of having no UV lights in the MarsHydro 300W LED Grow Light? 3.0.2 Is Mars Hydro LED 300W only suited to vegetables? 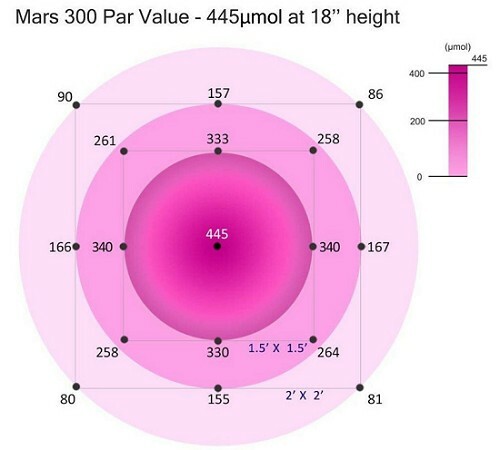 The PAR value of Mars Hydro LED 300W is 445μmol at 18” hight which encourages impressive growth of vegetables and other plants which illustrated in the image below. One unique feature is that the LED view angle features both the 90° and 120° angles. This is a crucial element in the grow light as it affects the light intensity and subsequently the total effective footprint whereby the 120° is the best angle for a wide coverage area of intense light in the area. The feature makes the MarsHydro 300W a diverse product with two different types of footprints. The Epistar 5W LED chips are essential in supporting the growth of the plants through a uniform light. 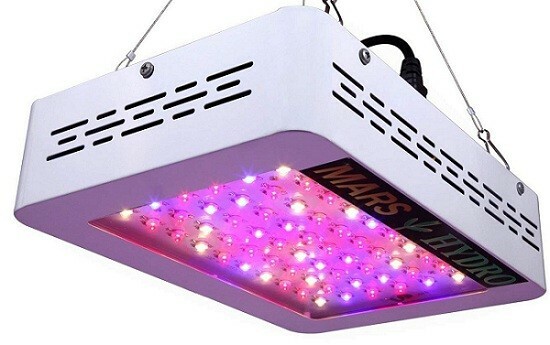 The fact that the MarsHydro 300W LED Grow Light has even light ensures that your plants do not suffer from sunburn and therefore do not become stunted in growth. An awesome noise-free fan and modern heat sinks ensure the product safety from issues such as overheating. MarsHydro 300W provides white light for plants that are designed to let vegetables grow uniformly & have a high yield. element for your grow area. The white light and full spectrum enable the product to enhance the ability of your vegetables to absorb light and therefore have increased yield and grow even bigger. Mars Hydro 300W review showing that it is one of the best led grow lights for tomatoes at home. Another advantage is that these Light is very affordable for the ordinary consumer. The price of this product is great given the amount of service it affords the user. I will say this is one of the best LED Grow Light under $100 in the market. It is user-friendly and only requires the user to plug it in. The product is excellent for hydroponics as it helps your vegetables such as tomatoes, chilies, and even lettuce to grow to their maximum size with very little effort. Finally, it is a great energy efficient grow light that is well within the energy savings ratings. This is great for the environment. Some disadvantages of the product include lack of ultraviolet and infrared light. It has only the white light which makes it a little bit limited in terms of how it can be adjusted. However, this disadvantage is minimal in that the MarsHydro 300W LED Grow Light still accomplishes what the customer needs. It’s small in size so I think its perfect for small plant growers but not a professional user. Another possible negative is that the grow light has a shorter lifespan compared to some other types of grow lights. But I think 50000 hours is not very short & more than 10 thousand gardener accepted this light. The bright light can negatively affect eyesight. So users have to ensure that they use protective gear like LED Grow Room Glasses when using these lights. What is the impact of having no UV lights in the MarsHydro 300W LED Grow Light? – While UV light can enhance growth in plants by affecting the phenolic compounds and flavonoid pigments among others, plants can still grow well without it. UV light is a form of electromagnetic radiation that is found in normal sunlight. In fact, as long as there is red and blue light, the plants are likely to grow just as well. Do not worry that there is no UV or IR light, your plants are receiving just the correct amount of light. Is Mars Hydro LED 300W only suited to vegetables? 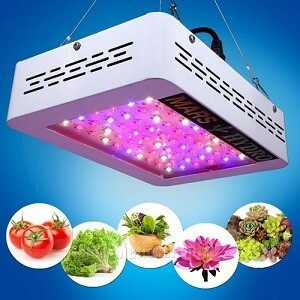 – This grow light is designed to cater to a wide variety of plants. The grow light is perfectly usable for flowers, vegetables, herbs, and even dwarf trees. Do not be limited in your indoor planting activities, plant away! From my personal interaction with the MarsHydro 300W LED Grow Light, the device is a great addition for your grow area. Keeping your vegetables growing and thriving through the grow light is the best way to achieve your goals while still using a cheap and wonderful design. Take the MarsHydro LED 300W and use it to make your veggies grow. Join me in the use of this marvelous product and enjoy all the benefits that it entails. Do not worry about the cost since you can easily afford it in comparison to other products. I like Galaxyhydro LED Grow Light 300W as another low cost LED Grow Light. If you want to check more best LED Grow Lights review, please visit our other web pages including the home page. 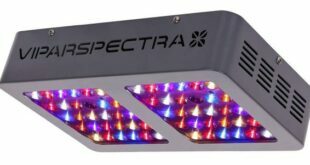 Next BESTVA 1000W LED Grow Light Review: Why Should I Invest?